It is the season of apples. I love apples! Green, red, sour, or sweet, I love them all. I have two apple trees. I didn’t plant any of them, they were here when we moved in. They are very old and, unfortunately, very sick. They produce little apples that are full of black spots and never reach picking size, they usually fall to the ground while still small. The inside of the tree is soft and rotten, probably a home to chubby worms. A local cooperative extension agent told me years ago that it’s pretty much impossible to grow organic fruit in NC and I fear he is right. There are just too many bugs and they are vicious. But I haven’t tried hard enough yet. I need to prune both trees back considerably, I need to dump a truckload of fertilizer around them, maybe cover the whole ground around them with yummy cow poop, and then mulch heavily and see what happens next year. And instead of waiting for them to come back to life I might try grafting a couple of branches if I can find another good apple tree (here is a step by step tutorial on how to graft fruit trees). If all fails I will spray them heavily. I might decide to go ahead and do it anyway for a couple of years to help the trees come back to life and then try to maintain them without the chemicals. We’ll see. A plan needs to form here, if you have any suggestions please comment below. Meanwhile, local apple orchards, the farmer’s market, and the grocery store will do because I am not giving up apples. I am not a huge fan of the famous apple pie (or any other pie), but there is an apple cake I make all the time that is so easy to put together and is so delicious. Find the recipe here. 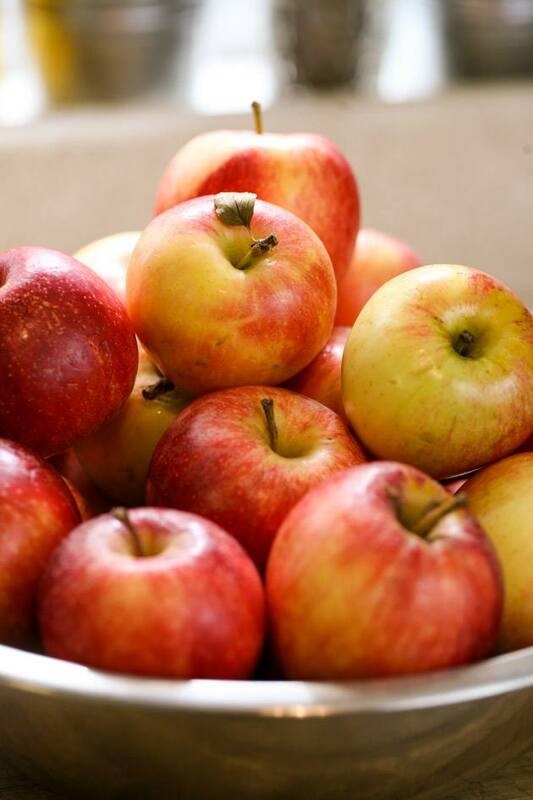 We also love apples as a snack, just raw by themselves or with peanut butter on top or dipped in honey. The apple-in-honey thing we do every September for the Roash H’shanna holiday and it’s definitely something to wait for. And then there is applesauce. The perfect baby food if you ask me. Mix it (or not) with a banana, peach, date, prune… anything really. 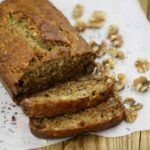 Add some baby cereal and your little one has an amazing filling meal. 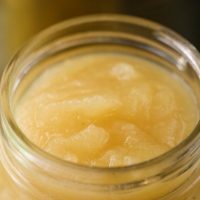 My other kids will eat applesauce anytime as well and there are so many great recipes that list applesauce as an ingredient. 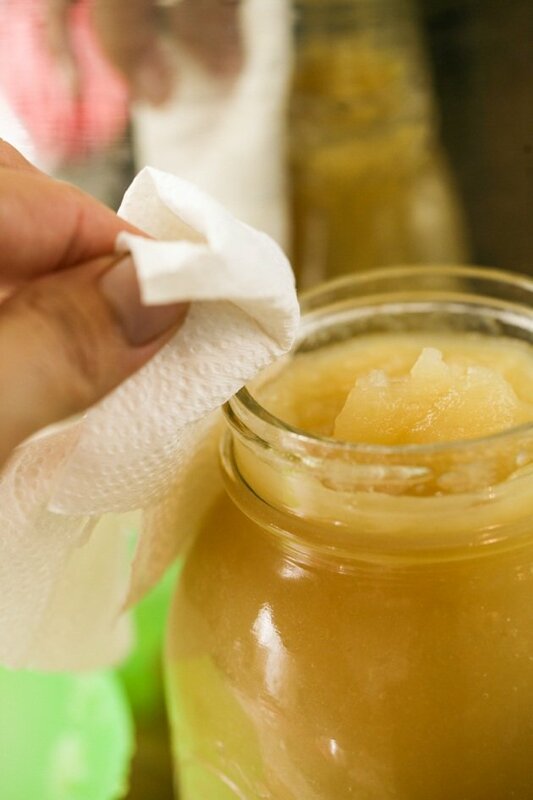 I was kind of surprised to learn that many people add a whole lot of sugar to their homemade applesauce. Why? 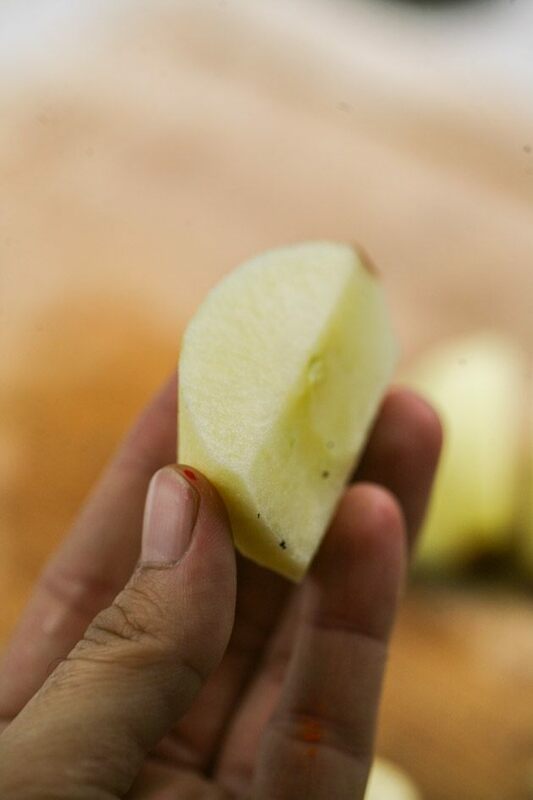 For us, the apples are plenty sweet this time of the year and there is no need to manipulate the flavor in any way. And anyway, you can always add sugar, maple, honey or spices latter. 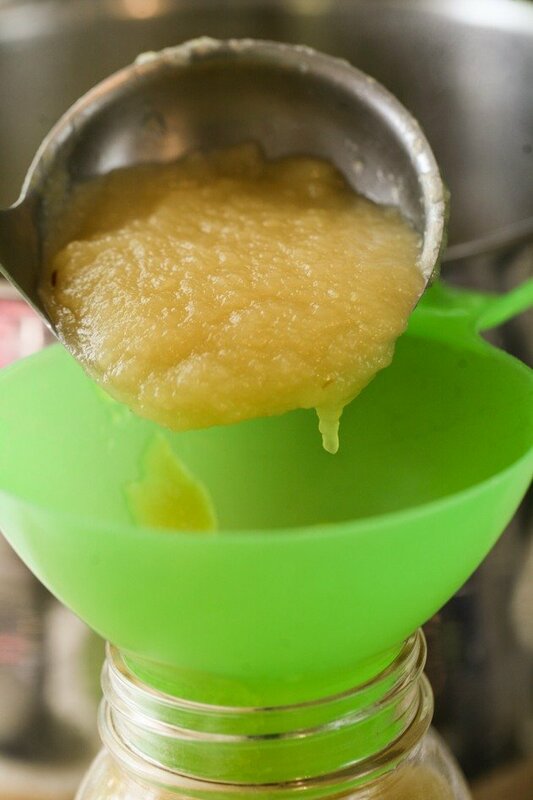 So today, I am going to share with you a super simple applesauce recipe. The only two ingredients in it are apples and water. That’s it, cause I don’t think you really need anything else. You can eat it right away, you can refrigerate it, you can freeze it, or you can can it. I made a big batch so I canned it. 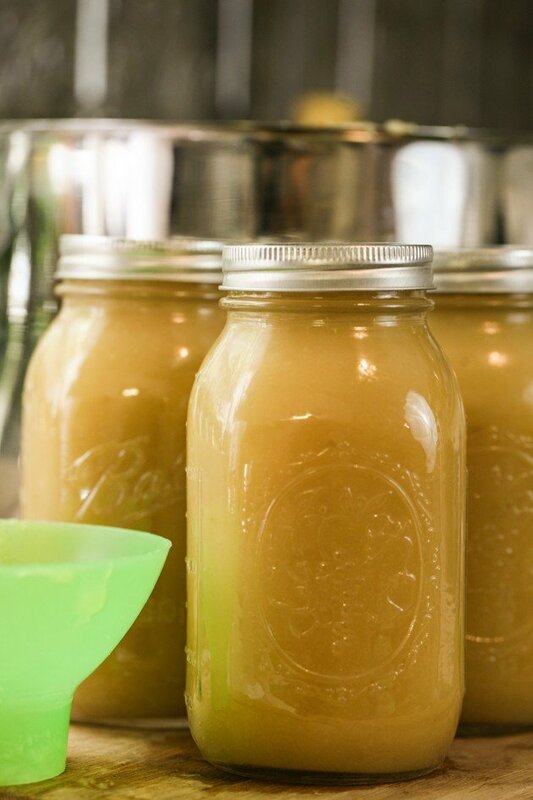 I like canning my applesauce even if it’s a bit more work because it saves room in the freezer that we need for the deer we hunt in the fall. Additionally, I don’t have to remember to thaw it, it’s always ready to eat. Since I had more room in my pot I decided to add those 6 large apples that I had in the fridge. I am not sure what variety they are but the nice thing with applesauce is that it really doesn’t matter, you can mix whatever apples you can find. Then in half again so your apple is now quartered. 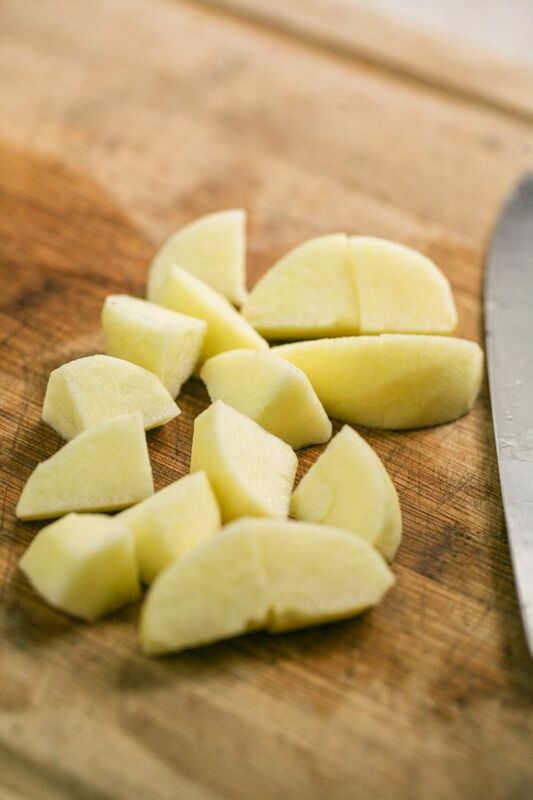 Position your knife at an angle above the core area and cut it off. You are left with a clean quarter apple. I like dicing the quarters because they cook faster this way but you don’t have to do this step. 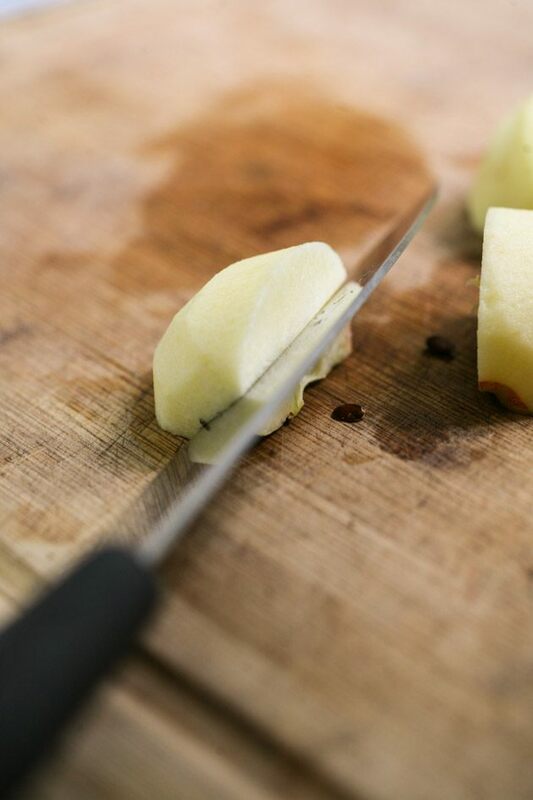 It will take some time to clean and cut all the apples so make sure you keep the ones that are done in a bowl of cold water so they don’t turn brown. Like a good old homesteader, I try not to throw away anything, so the peels and the cores are collected and put in a big jar to make apple cider vinegar. I will share that recipe in a few weeks when it is done, so stay tuned. So now that we have all of our apples clean, drain the water and transfer them into a large pot. I used a 12-quart pot and two-thirds of it was filled with apples. 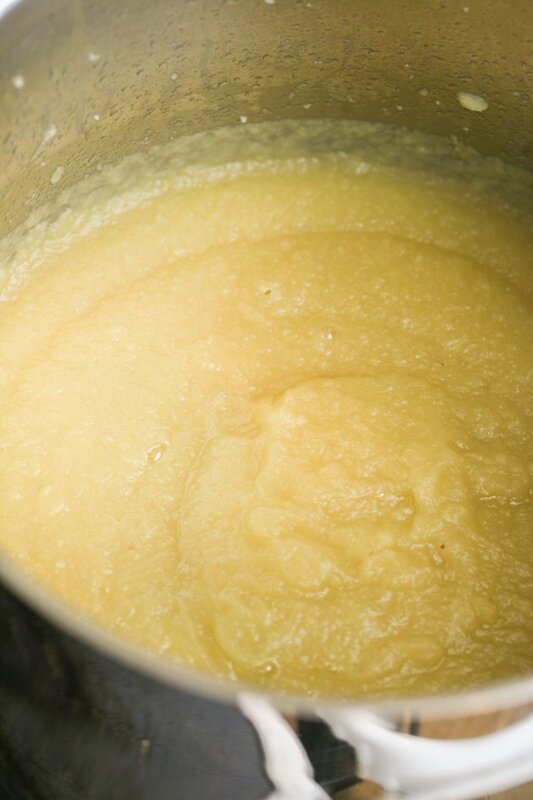 I like my applesauce on the thick side so I only add 2 cups of water (you can add more water later if it’s too thick for you). 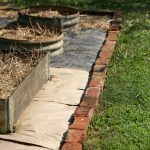 The water will also help prevent sticking and scorching. Cook the apples on medium heat stirring frequently. 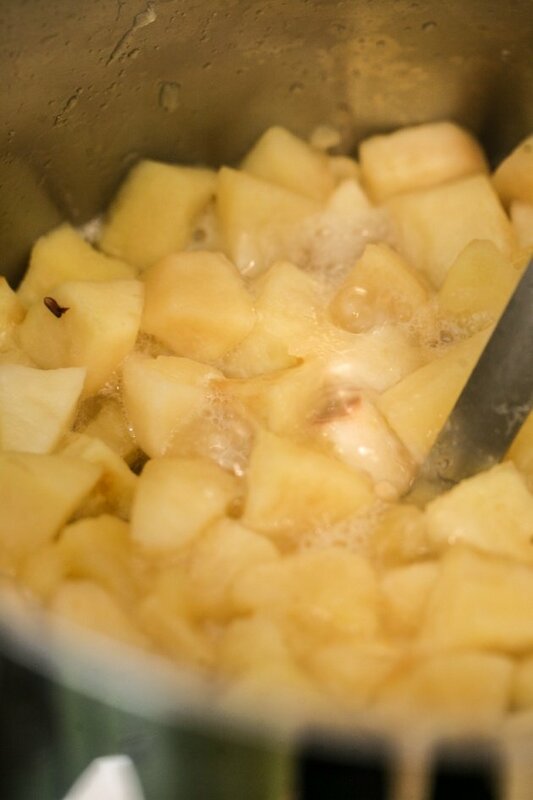 It took around 15 minutes for the apples to start to soften but this time depends on how many apples you are cooking. You will see that they change their color a bit and you can just pick a piece with a spoon and test it. When all your apples are soft (it took about 30 minutes for mine), remove the pot from the heat and let it stand for a few minutes. Then mush the apples with a stick blender. Please make sure you remove the pot from the heat and let it rest before you use the stick blender! Or the hot applesauce will explode and burn you. Don’t ask me how I know that. You can leave chunks in the sauce or you can blend it smooth and creamy, I like it smooth and creamy but since you are making it at home you get to choose how you like it best and it doesn’t matter as far as canning goes. Also, this is the time to add more water if the sauce is too thick for you. It’s better to add boiling water and just add a little bit at a time and stir until you reach the right consistency. Your applesauce is gone! If you like it hot you can go ahead and fix yourself a bowl. You can sprinkle brown sugar on top if it isn’t sweet enough for you, or you can add maple or honey. 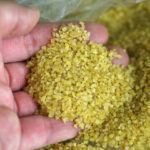 You can also sprinkle on cinnamon or nutmeg or any other spice you like Or you can just eat it as it is. I made a large batch and I already have some applesauce in the fridge so I canned all of it. 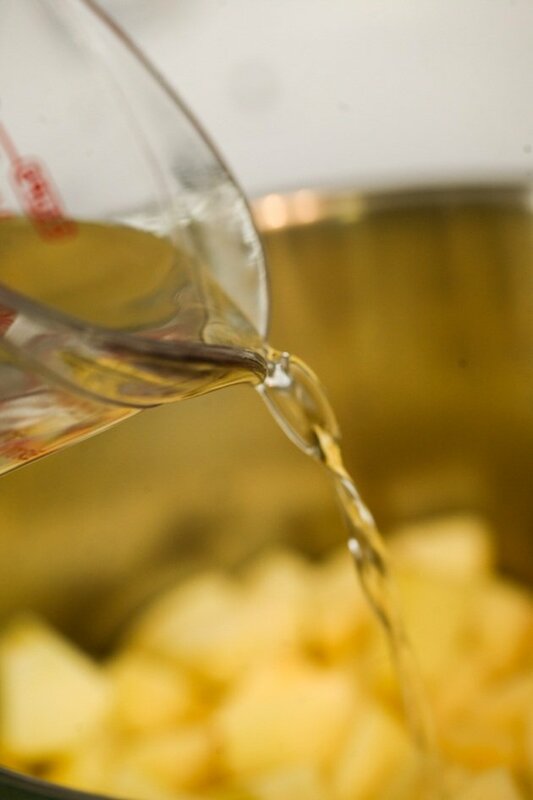 You can start the water bath while the applesauce is cooking but you don’t have to. For me, with four kids running around it’s too hard to do so many things at once so I cooked the applesauce and set it aside and then started the water bath. 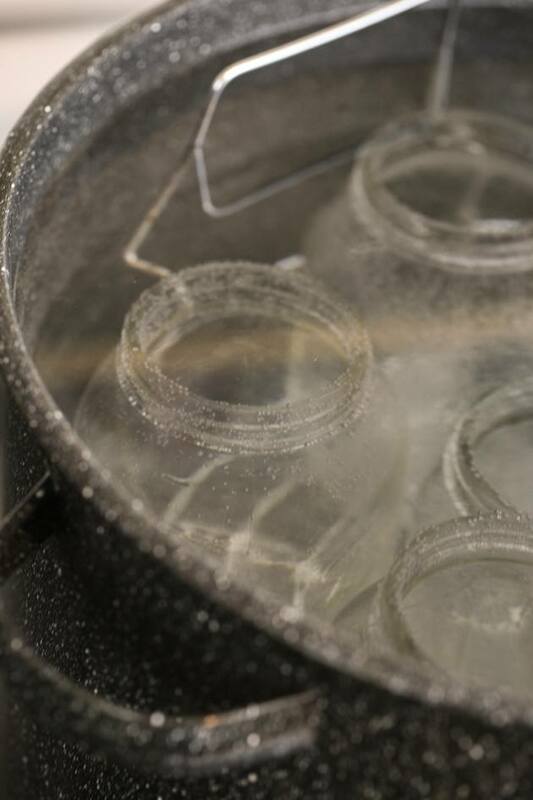 I placed four-quart jars on the rack inside a water bath canner and filled it with water so the jars are covered by an inch. Turn the heat to high and let the water reach boiling temperature. Then boil the jars for 5 to 10 minutes. The lids and the rings of the jars go in a different smaller pot where they are boiled for 5 minutes as well. (**Update: I am told that the new Ball lids don’t need to be boiled. I didn’t research this myself so it is up to you. If you don’t use Ball you might want to boil or just boil anyway). You can reuse rings but make sure you use new lids. 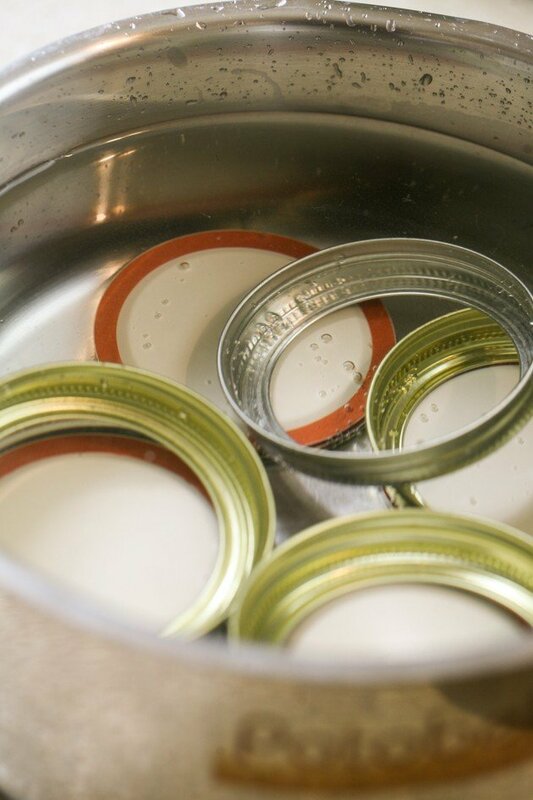 While the jars and lids sanitize, gather your canning equipment. And a clean paper towel. The easiest way for me to do it is to set everything, including the pot of applesauce, on a large wooden cutting board close to the stove. 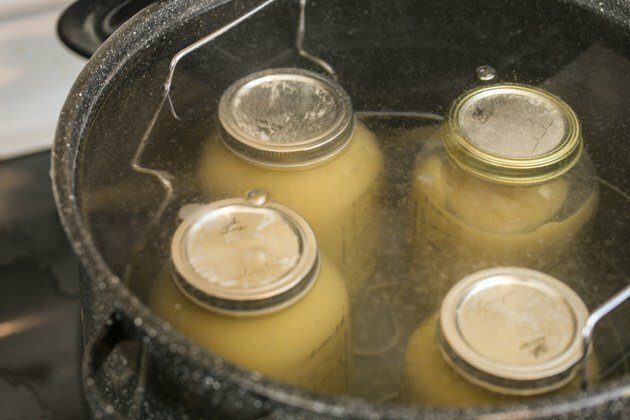 Once the jars spent 5 to 10 minutes in boiling water, you can turn the heat off (do that for the lids as well) and start canning. And use your ladle and funnel to fill it with the sauce. Make sure to leave half an inch of head space. Also, make sure you don’t touch the inside or the top of the jar with your hands, we don’t want any germs there. Use the bubble popper to remove any air pockets and bubbles. This will help us ensure a good seal. Fish a lid with your lid lifter from the pot of water they are still in and set it in place without touching the rim or the bottom of the lid. Secure the lid in place with a ring. Don’t tighten it at all, just what we call “finger-tight” or in other words so that it is securely in place but not tight. The last and very important step is to process the filled jars in the water bath. Put them back in the pot (on the rack), you will probably have to remove some of the water (be careful here cause the water is still hot). Turn the heat to high. Bring the water to a rolling boil and process the jars. The processing time depends on the altitude of where you live. 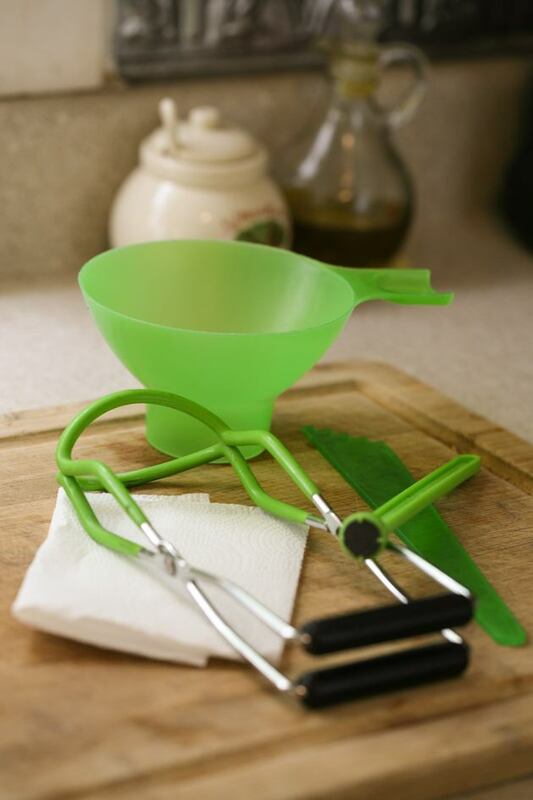 When the processing time is up, use your jar lifter to remove the jars from the pot and set them on the counter on a kitchen towel. Within a minute or so, you will hear the “pop” sound of the jars sealing. Just like collecting fresh eggs, this “pop” never gets old! From this batch, I filled three full quart jars and one that I filled three-quarters of the way. I processed this one as well and it sealed but we will use that one first. Isn’t that beautiful? 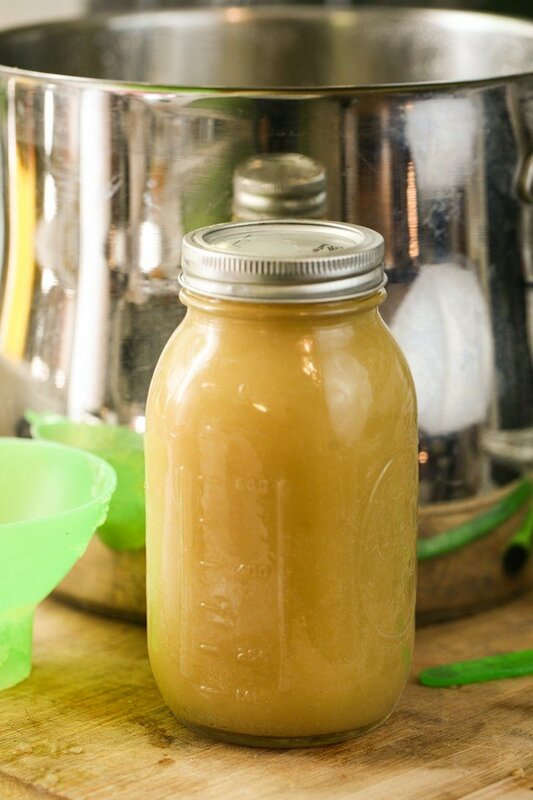 Your homemade, chemical free, pure applesauce! And it’s even better if you grow your own apples. The thing with canning is that it’s a lot of work and the result is so gorgeous and amazing that you just want to put the jars on a shelf and look at them all day. I often have to convince myself to open the jar and eat what’s inside, LOL. But we always do, and it’s healthy and delicious! 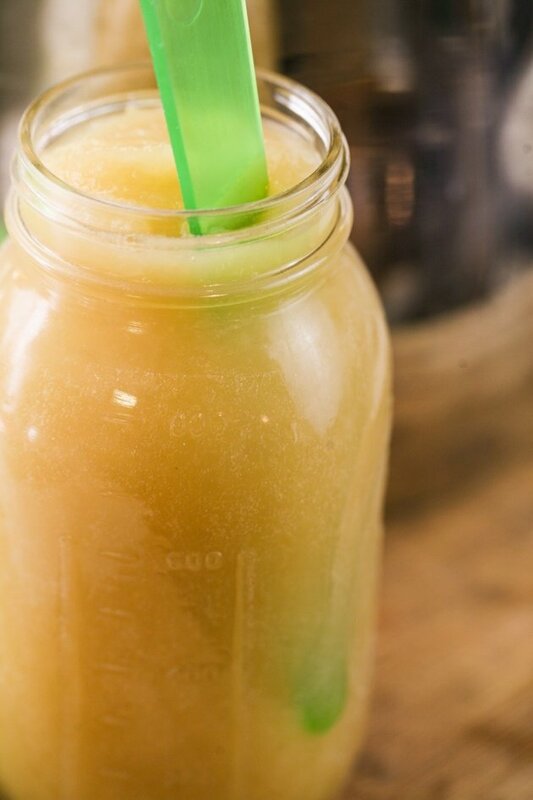 Another nice thing with applesauce is that you don’t need to use anything but apples. 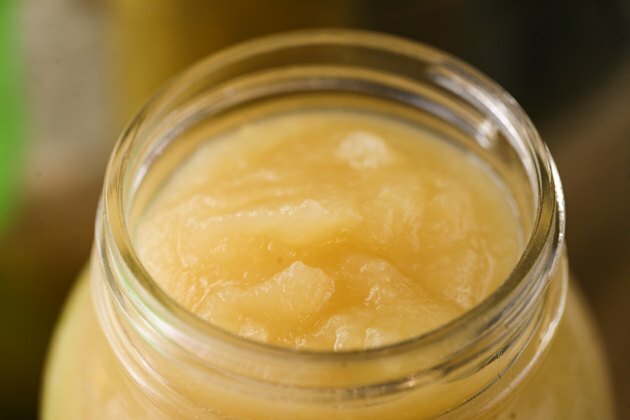 Some recipes call for lemon juice but I never add it and it doesn’t seem to hurt my applesauce. I hope you found this informative and I hope you’ll try your hand at homemade applesauce this season! 1. If you don't have a food mill, peel and core the apples. You can then slice them to thinner pieces or dice them so they cook faster. 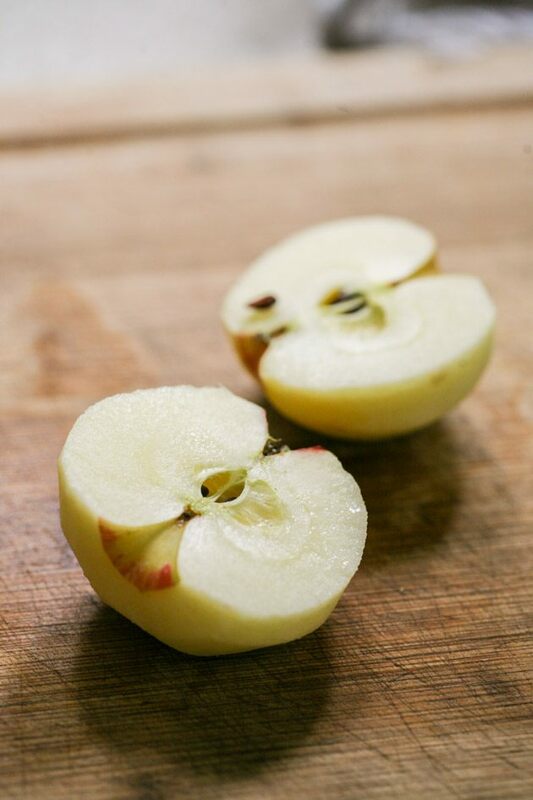 While you work on the apples, place the ones that are done in a bowl of cold water so they don't turn brown. 2. 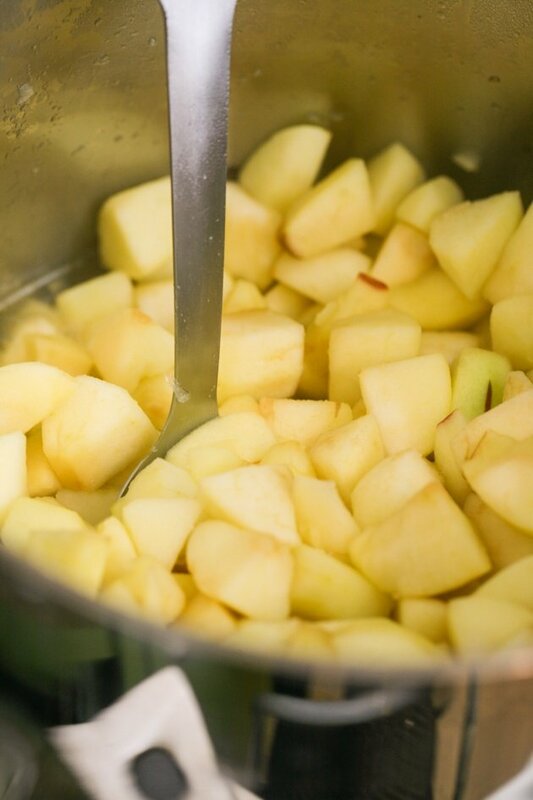 Add the apples into a large pot (make sure you have plenty of room to stir them). Add 2 cups of water and set on medium-high heat. 3. 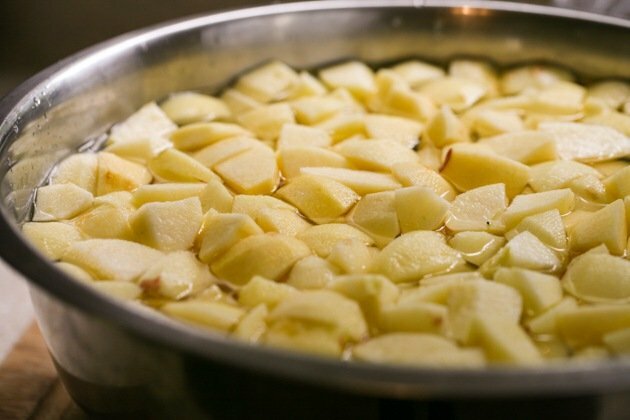 Cook for approximately 30 minutes or until the apples are soft. 4. 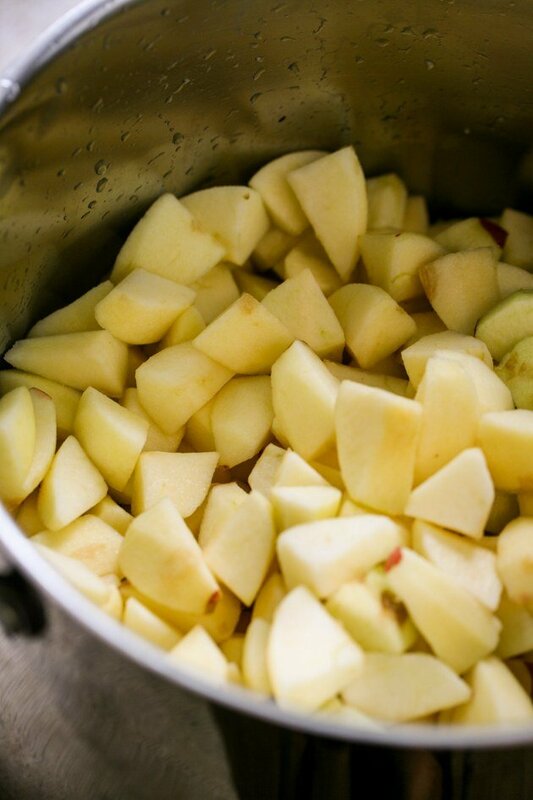 Remove the pot from the heat and let the apples rest for a few minutes. 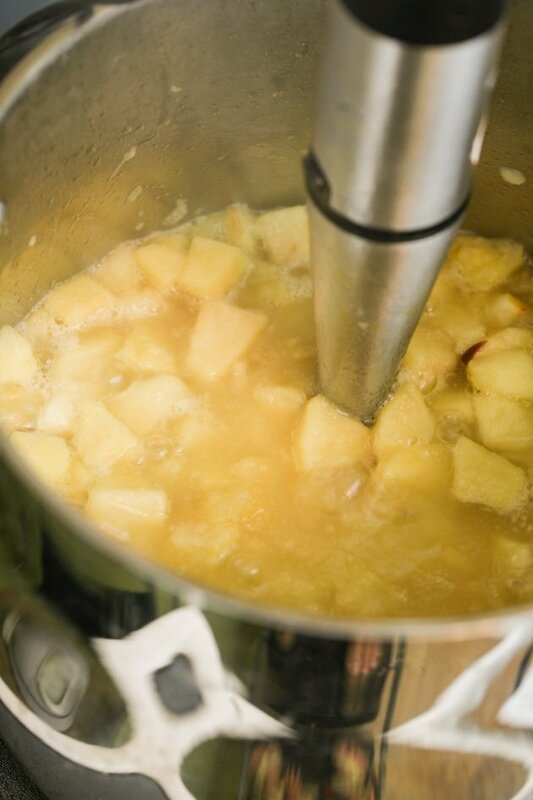 Then use a stick blender to mush the apples to the consistency and texture you like. 5. 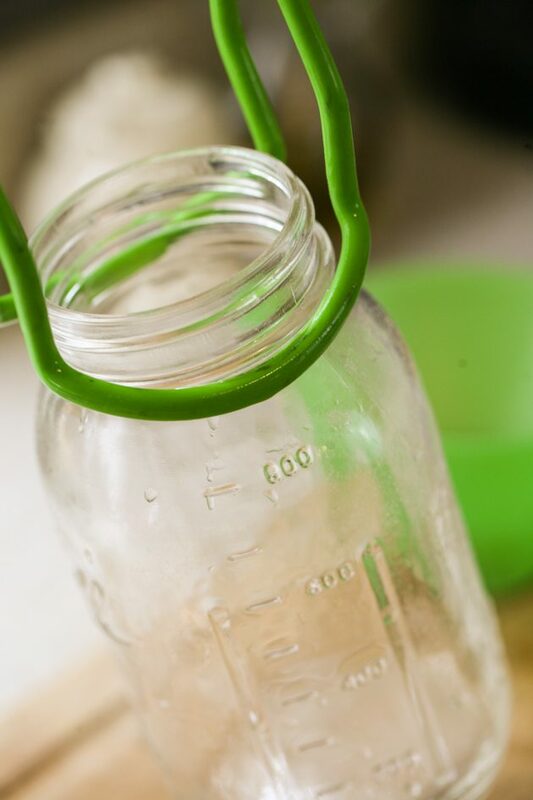 Sanitize your jars, lids, and rings in a water bath canner. 6. 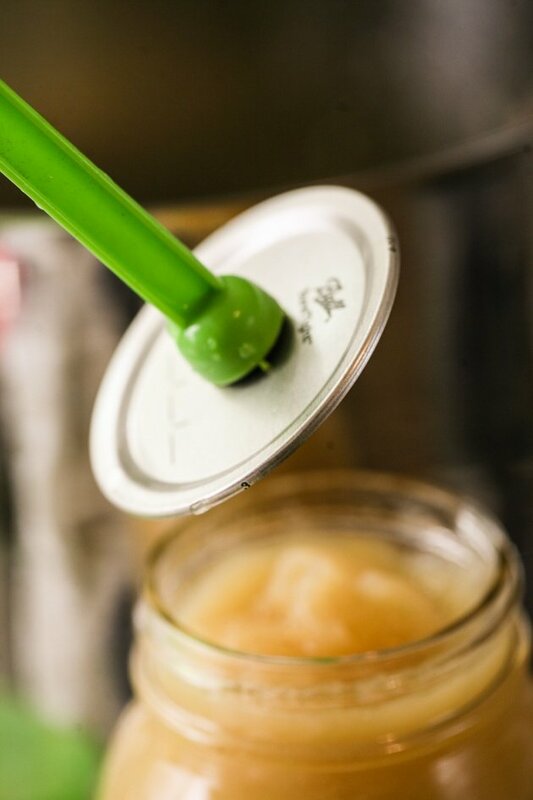 Fill you hot jars with hot applesauce using a funnel and a ladle, remove air bubbles, clean the rim, cover with the lids and secure with the rings. 7. Process in the water bath according to your altitude. 8. Use your jar lifter to remove the jars from the water bath and set on a kitchen towel on the counter undisturbed for 12 hours or so. 9. Check that the jars sealed and store in the pantry. I just got through canning my pears and picking the last 6 off the tree today for the final “fresh eating”, it was a glorious pear year! The apples are looking good too and I’ve harvested some to make my Deep Dish Pear & Apple bake (It’s like pie but without the crust!). 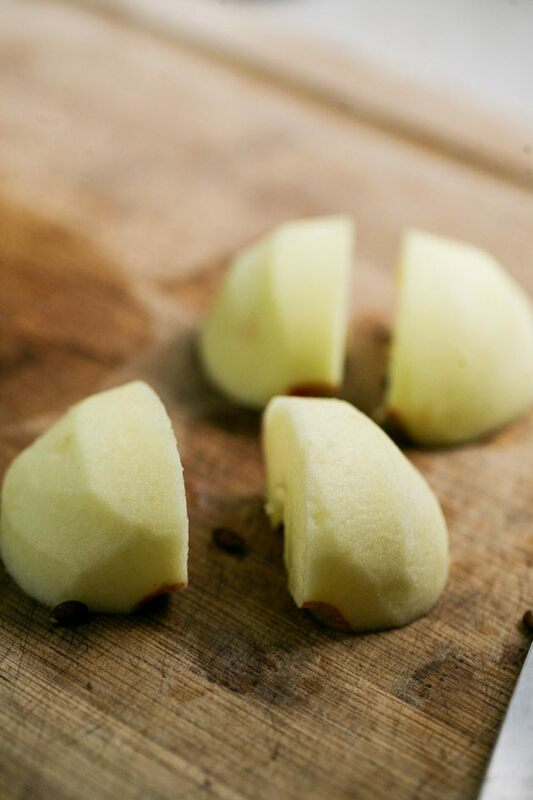 Very ripe pears can also help sweeten your baking apples which tend to be more tart. Lee, your 2nd apple looks like a “Red Delicious”. They originated in Iowa in 1880. A good eating apple but not good for baking. LOL! The very first apple pie I baked was with Red Delicious and when it was done the apples shrunk to a very thin layer (they freaking disappeared!) and I had this high mountain of crust! When I went to cut it the mountain collapsed! My dinner guest started laughing! I was very embarrassed! Thank goodness I had ice cream to fill the bowls and spoon the little amount of apple filling on top! I feel so bad for your poor old apple tree. It does need some tender loving care and a good pruning and feeding (light in fall and heavy in spring) is necessary. My friend Sally had the same problem, we chatted and she called an arborist to care for her tree. She was amazed that the tree again produced fruit! I grow 100% organic. I have bad bugs too but I trust “The Natural”…call it G-d, The Great Spirit, The Earth Mother..ya-da……ya-da…..but I trust and have faith in the “Good Guys”. I’ve sat in my garden chair and watch in deep meditation nature at work. It’s truly beautiful when you reach a “balance” with nature. Your in a “good place”. You can grow fruit trees….but they need companions…herbs, beans, squash, berries………and spiders! I agree with you very much! I, too, believe in this beautiful balance 100% this is why I said that I didn’t try hard enough yet. My problem is that I often don’t have enough patience. I need to learn how to chill! It’s not hard for me with vegetables because I don’t have to wait a long time to see something happening. In just a few short weeks we go from planting a seed to harvesting food. But I love fruit and it’s totally worth the time of waiting. I am a bit mad at myself that I’ve got those fruit trees (that were here when we moved) for a year now and still didn’t find time to care for them. I’ll do it this fall for sure and hopefully I’ll see some improvement next year. I also have pear and plum. They are sick too. 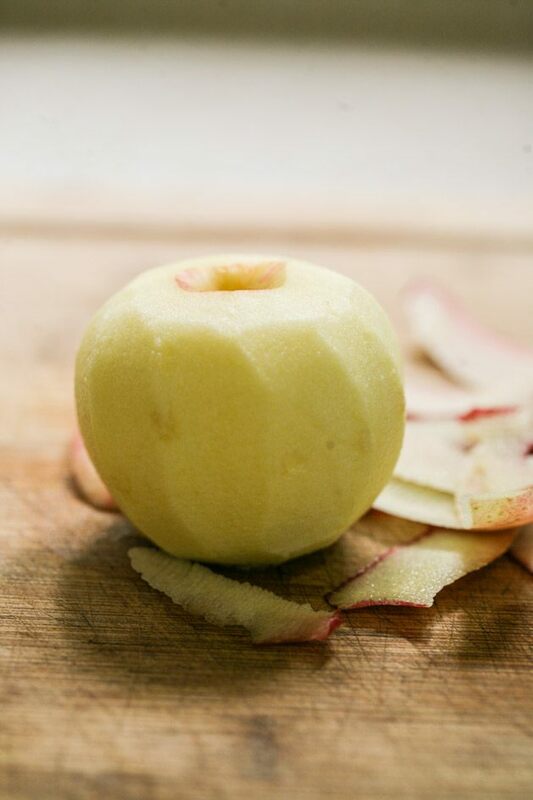 Pear goes so well with apple, they are really best friends.